MAGNOLIA MIRACLE — This is the subject line of the email I received from my mom. 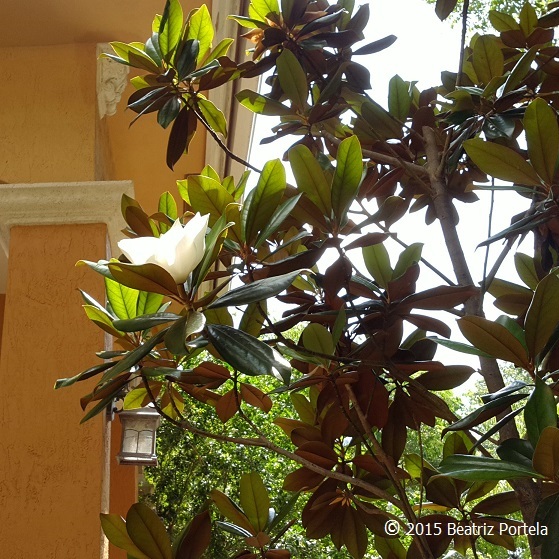 Let me backtrack….She had purchased a small Magnolia tree seven years ago, with flowers on it, and planted it in her front yard. Magnolias don’t do well in South Florida but she really wanted one. The next year, the tree only managed to squeak out 2 blossoms….on Mother’s Day! She had gotten so excited with this present on her day. Then the tree went dormant….for seven long years….until now. The Magnolia now has two beautiful blossoms and another on the way. Mom is in bliss! I had to go over to take a picture of the miracle. The bark and flower buds of Magnolia Officinalis are used in traditional Chinese medicine. I used to live in south Florida and I love Magnolia. And the large flowers are magnificent, beyond this world. I can relate to your mom’s desire to have it. I always think trees know how you feel, plants too. If you take good care of them, they will reciprocate. I love the story behind your mom’s bliss and Great photo by the way!